Every year, the John Lewis Christmas advert becomes a topic of national discussion. Particularly on Twitter. And every year, it’s not just John Lewis the retail outlet that garners attention for the advert, but a man out in Virginia, USA who shares the same name. This particular John Lewis has the handle @johnlewis and receives more than 50,000 tweets a year meant for the chain. John Lewis (the person) gets thousands of tweets directed to him rather than the retail store every year because of his handle name (@johnlewis) 2018 has been no different after the broadcast of one of the most eagerly awaited TV moments of the year – the John Lewis Christmas Advert. 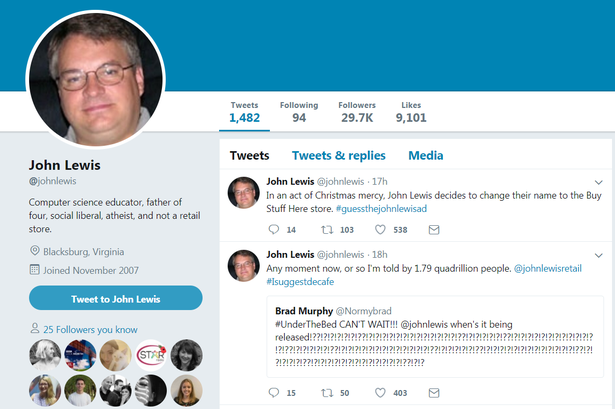 John Lewis (the person) has seen a spike in tweets directed to him rather than @jlandpartners (the outlet’s handle). As he does every year, he replies to the many tweets inadvertently sent to him and directs users back to the store’s handle. So with all the discussion around the John Lewis Christmas advert, Twitter have made the real John Lewis the star of their very own Christmas advert. It’s a wonderful touch to a man who has developed a bit of a cult following over the years. The ad shows us John’s dedication to witty responses of his mistaken identity as well as how he deciphers some of the English words Americans might not be quite so familiar with. And it wouldn’t be a Twitter ad without a hashtag. #NotARetailStore is a dedication to the same line John Lewis (the person) has in his Twitter profile.